Normally I sort of turn my nose up to kitschy add ons to knitting. I mean, I don't know how much accessorizing knitting needs. Ribbons and extraneous buttons are often a turn-off in designs to me. The errant right ribbon and button can totally work. These are rare occasions. 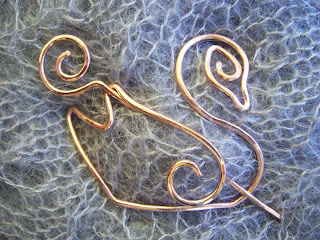 However, I did stumble across this shawl pin (a heretofore previously eye rolling accessory in my book) made especially for the MS3 shawl. Recall that the shawl is in the theme of Swan Lake. You can find it at the Rosemary Go Round blog. $45 for the sterling silver is a bit steep but it truly does make the perfect accessory for the Mystery Stole. I am showing it here in copper because it sets off a bit better in the photo. It is stunning. Also, the ball of yarn earrings (scroll down in her post) are ultra cute, too. I think I need to print out her blog and leave it around my house for my muggles to find it.